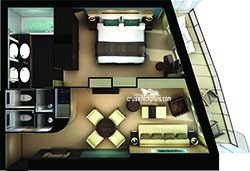 These are the typical floor plans for Aft Penthouse Staterooms. Actual room layout and decor might be different. 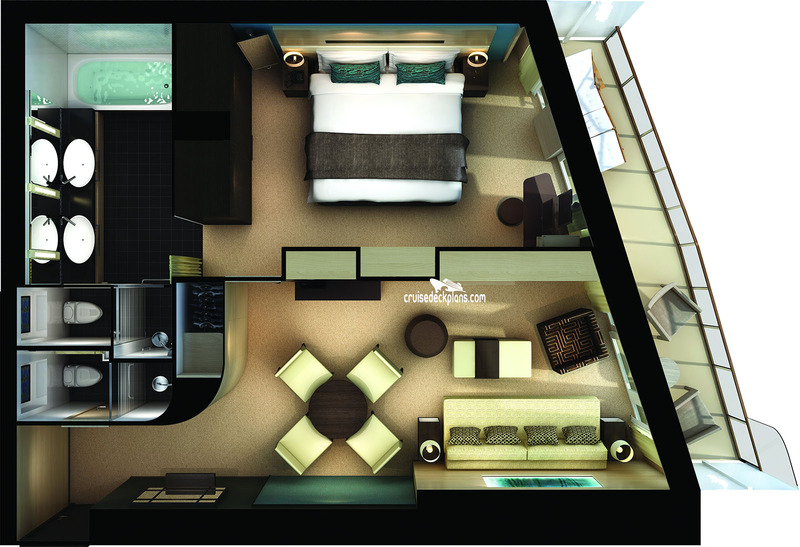 IMPORTANT NOTE: Category H6 on decks 9, 10, 12, 13 aft suites have large window in bathroom overlooking aft balcony. Category H6 on aft of decks 11 and 14 have bedroom overlooking aft balcony. This is a Aft Penthouse Stateroom. There are 12 of these types of cabins on this ship. The typical cabin size is 420 sqft (39 m2). The typical balcony size is: 75 sqft (7 m2). These types of cabins can sleep up to 4 people.